VRC Racing | Ken & Barbie 2018 – Results! Home / Racing / Ken & Barbie 2018 – Results! Ken & Barbie 2018 – Results! 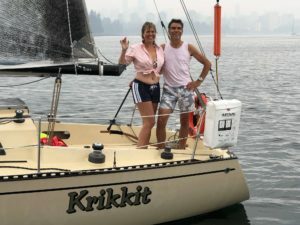 It was a cold, wet and fun Ken and Barbie race yesterday in English Bay! Thank you to Henk for allowing us to use Blue Peter as RC boat. Thank you to Henk, Nancy, Wilter and Brad for volunteering as our Race Committee! Thank you to the five boats that came out to compete: Wraith, Krikkit, Cayoosh, XS and Tangleberry! Congratulations to Krikkit’s Ken & Barbie for taking home the best dressed award. See you next summer!